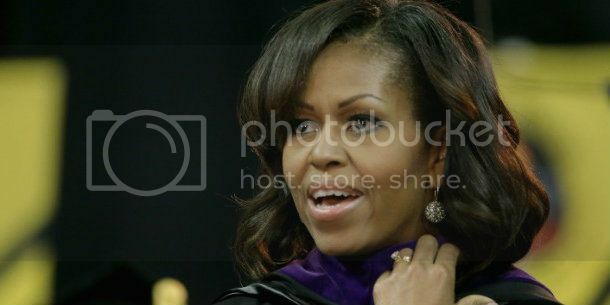 First Lady Michelle Obama delivered a commencement speech to historically black Bowie State University's class of 2013. She spoke with her characteristic eloquence and grace, but some of Mrs. Obama's remarks have found controversy. Is Mrs. Obama unfairly pinning the blame on African-Americans who face exceptional structural disadvantage when seeking success? "But today more than 150 years after the Emancipation Proclamation. More than 50 years after the end of Separate but Equal. When it comes to getting an education, too many of our young people just can't be bothered. Today instead of walking miles everyday to school, they're sitting on couches for hours playing video games or watching TV. Instead of dreaming of being a teacher, or a lawyer or business leader, they're fantasizing about being a baller or a rapper. Right now 1 in 3 African-American students are dropping out fo highschool. Only 1 in 5 African Americans between the ages of 25 and 29 has gotten a college degree, but let's be clear today getting an education is just as important or more important than when this school was founded....We need to start feeling that hunger again. We need to once again fight to educate ourselves and our children like our lives depend on it because they do." What do you think of the First Lady's comments?